Growing up in New England, our family meals were never extravagant (except for the once in a while splurge or holidays) and we usually stuck to normal New England fair. That doesn’t mean lobster boils every day, chowdah every night, salt water taffy for dessert, cobblers, maple syrup with buttermilk pancakes every morning and so on. It would have been nice, but being realistic, average New England food is more like the occasional pot roast, grilled steaks with baked potatoes, lots of salads, bbq chicken, a lot of Italian and pastas and so on. Sound more like traditional American? My mother is a good cook who doesn’t have the patience to really master the art. Like any other disciple, you have to be passionate about it, and it’s not for everyone (she is, by the way an EXCEPTIONAL pianist). Of the few things she makes well, apple sauce was probably one of the most bankable. It beings back good memories of the times we had in the kitchen together. To this day, I can not make it exactly how she does. But I come damn close. This apple sauce, due to the acid/sugar content, can be made and stored for weeks in the fridge with no chance whatsoever of spoilage. It goes with so many things: pot roast, roast chicken and turkey, potatoes, pork (obviously) or even by itself (a dollop of whipped cream never hurt it). She uses a variety of apples. Fall in New England is good for that. But you want to choose something tart and something good for baking or saucing. McIntosh, jona gold, jona red, Jersey Macs, and so on. Granny Smith, red delicious and the New Zealand don’t work as well. 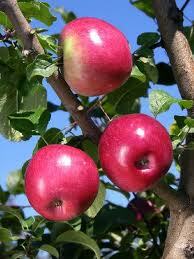 The apples are high in natural pectin, which is a thickener, so the sauce will thicken on its own. A little lemon juice really helps offset the sweetness and brings out a lot of natural flavor (balance). And of course cinnamon. You cannot cook apples in New England with out cinnamon in there. This is my favorite apple sauce in the world and one of the best things my Mother ever made (unless she’s come up something really new and incredible). Core the apples. Using a peeler, remove about half the skin from the red apples, and all the skin from the gold. Cut into 1/2 in chunks. In a medium sized stock pot, begin cooking the golden and softer apples over high heat. As they begin to soften, add the other apples. Add the water, lemon juice, cinnamon and sugar. When boiling, turn heat to med-low and cook, stirring occasionally. When thoroughly softened, use a potato masher to crush the apples. Continue cooking until thick. If sweet, add more lemon. If not sweet enough, add a little more sugar. Add more cinnamon if you think you need it. The sauce should be well balanced between sweet and sour (a little more on the sweet side, that’s how my mother makes it), good amount a cinnamon and thick. Do not puree or over work. Bits of skin and chunks of apples are good. Let cool completely.